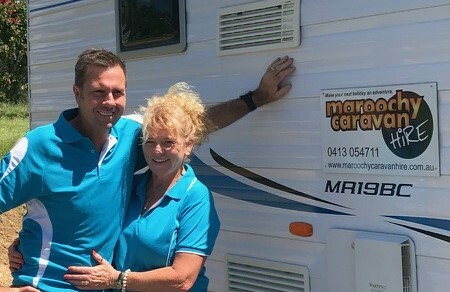 It is with great excitement and enthusiasm that Sally and Stu have taken over Maroochy Caravan Hire in late March 2018. We would like to thank Wardy and Nic for all the valuable information that they have passed on to us about the business. We will do our absolute best to continue to give the same fabulous service that they have delivered over the last nine years. We are looking forward to meeting you all and help you to have a wonderful caravanning holiday. Don’t forget to let us know about your special requirements to make your holiday great. We have all of your bookings and deposits locked in and are ready to go.....We are here to ensure your holiday is always an adventure to remember. Enjoy the outdoor experience with all the comforts of home. Maroochy Caravan Hire offers fully self-contained caravans for short and long term hire. Annexes,Barbeques, Generators, Solar Panels, Linen, Tents and many options are available. Maroochy Caravan Hire is a family owned and operated business. Sally and Stu will ensure you have a great Aussie holiday. You can collect or we offer delivery, set-up and collection to sites. Affordable and fun, we do our best to accommodate your families individual needs. Ideal for couples or families at realistic prices. What are you waiting for? Contact us today and let your adventure begin.